Save $20 and It’ll cost ya! When choosing a paint the smart money is on the good stuff. A very simple guideline is what it costs. I have always found it fascinating that we spend $300 a gallon for the paint used to paint our cars and $30 a gallon for the paint we use on our homes. Spend as much as you can afford on a quality product! Here is a good example of how you can save on a gallon of paint and it ends up costing you. 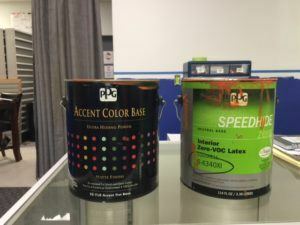 Here are two quality coatings. Both are Pittsburg Paint products. The one on the right Speedhide is a good product used by many paint contractors. Most contractors will pay in the mid teens, say $15, a gallon. The one on the left Accent Color Base is a great product but costs almost double. They are the same color. 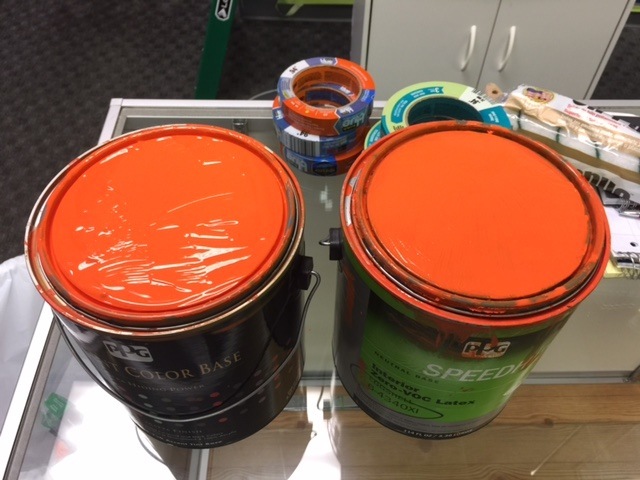 Both are quality acrylic latex products but the one on the left is designed for high hide/coverage. So with the Accent Color Base 2 coats will get the job done. The Speedhide will take multiple coats which means much much more time. In this example it took 8 coats to cover a grey color. That’s not a typo. 8 coats. So from a contractors perspective if you are paying someone $18 an hour to paint those 8 coats guess what saving money ended up costing you. If you are doing the work yourself, just imagine the time investment for those extra coats of paint. This happened to be a small commercial job that gave us the opportunity to test the difference between the two. My guess was it would be 4 coats of Speedhide. I’m glad we planned on using the Accent Color Base.